How Can Uranium-235 Affect Human Health? Uranium-235 is a naturally occurring isotope of Uranium metal. It is the only fissile Uranium isotope being able to sustain nuclear fission. 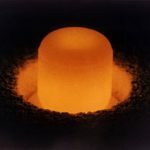 Uranium-235 is the only fissile radioactive isotope which is a primordial nuclide existing in the nature in its present form since before the creation of Earth. Arthur Jeffrey Dempster was the first person to discover this radioactive metal isotope in 1935.Uranium-235 makes up around 0.72% of the total Uranium found in nature with Uranium-238 (another radioactive isotope)making up above 99% of the remaining mass of the metal. Uranium-235 is separated from Uranium-238 following the diffusion process using Uranium Hexafluoride (UF6) gas. 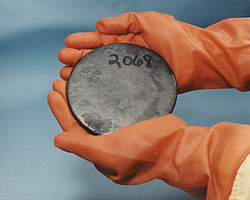 Highly enriched Uranium may contain up to 40% Uranium-235. The symbol or formula for this radioactive isotope is 235U. It is also denoted by U-235. 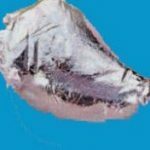 Appearance: It is a silver colored metal. Molecular Weight: The molecular weight of this metal is 235.044 g/mol. Atomic Number: The atomic number for this metal is 92. Atomic Mass: Its mass number is 235.0439299 u (unified atomic mass units). Critical Mass: The critical mass for this radioactive isotope is 52 kg. Critical Diameter: Its critical diameter is 17 cm. There are 92 protons and 143 neutrons in the nucleus of one isotope of this radioactive metal. The unstable nucleus of this radioactive isotope loses energy by emitting ionizing particles for reaching a stable state. It undergoes Alpha decay by radiating Alpha Rays (α) with decay energy of 4.679 MeV. Here, the He (Helium) is representing one Alpha (α) particle. Uranium-235 undergoes spontaneous fission during radioactive decay; however, no standard equation can represent this reaction as its results are quite unpredictable. This radioactive isotope takes 703,800,000 years to decay and reduce to the half of its initial amount. It was the first fissile Uranium isotope to be discovered. When one neutron from U-235 fission reaction causes another nucleus of this metal to undergo fission, it causes the entire chain reaction to continue. This condition is called the “critical condition” while the mass of U-235 required to produce this condition is called “critical mass”. It is possible to achieve critical chain reaction with low concentration U-235. In these cases, the neutrons are moderated to lower their speed in the reaction as the chances of fission are greater with slow neutrons than with fast neutrons. This chain reaction produces many intermediate radioactive mass fragments that are capable of producing energy by undergoing radioactive decay themselves. The fission of Uranium-235 produces high amounts of energy. Most of the total Uranium-235 breaks down into smaller nuclei during fission. Only a minute amount of this material undergoes neutron capture forming Uranium-236. The fact that this isotope is a fissile material able to produce large amounts of heat and energy makes it highly useful in industries. It is widely used in nuclear reactors for being able to produce enough electrons to sustain or continue nuclear fission reaction. However, it needs an electron moderator to help it sustain the chain reaction by slowing down the electrons. This is due to the reason that the concentration of U-235 is very low in naturally occurring Uranium. Sometimes, control rods are also used for slowing down the whole process in nuclear reactors. Control rods are made from elements like Boron and Cadmium which are able to absorb the excess Alpha particles without undergoing fission themselves. With the help of the moderators and the control rods natural Uranium-235 can be used for industrial purposes. It is used as power supply for weather stations in remote areas and space vehicles. Uranium metal enriched with Uranium-235 is used in heavy water reactors while light water reactors use low enriched Uranium. This radioactive metal is sometimes used in the production of nuclear weapons as a substitute for depleted Uranium. Highly enriched Uranium was used for the atomic bomb named Little Boy which was dropped on Hiroshima during the 2nd World War (6th August, 1945). The radioactive properties of this isotope are used to determine the age of many objects including fossils and rocks. The long half life of this metal helps to find out the correct age of these objects. This radioactive substance can enter human body through inhalation or ingestion of contaminated food or water. Most of the inhaled or ingested U-235 leaves the body excepting a small part which stays accumulated in kidney or bones undergoing decay. It increases the risk of liver damage and cancer. Uranium-235 can be used as a rich source of energy. One pound of this radioactive material contains the same amount of energy as one million gallons of gasoline. To obtain this much energy from this metal, it is necessary to enrich naturally occurring Uranium to contain at least 2-3% Uranium-235 instead of just 0.72%.